This section of the track, known as the Devil's Staircase, is steep - climbing from 1400 to 1600 metres above sea level. You will need to take your time on this section, but on a clear day the view down the valley and out across the surrounding countryside is well worth it. Out towards the west you may catch a glimps of the perfectly formed volcanic cone of Mount Taranaki. Be sure to take care, as underfoot you will be trekking over layers of ancient and modern lava flows and other volcanic deposits, the track surface is anything but smooth. The track veers slightly left five minutes before reaching South Crater. 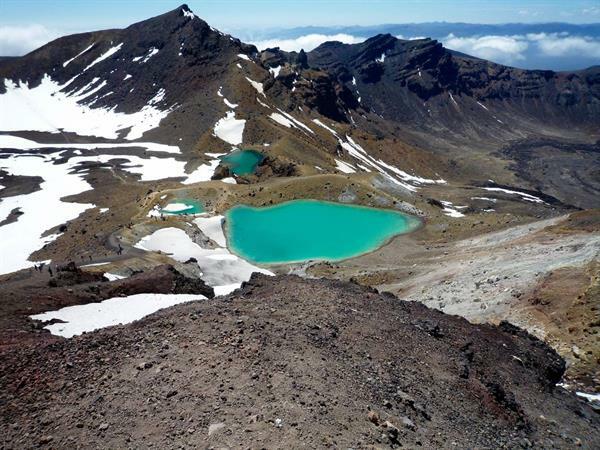 To continue on the Tongariro Alpine Crossing follow the marked route.